Ulaanbaatar /MONTSAME/ Minister of Energy Ts.Davaasuren on April 10 met with Ambassador Extraordinary and Plenipotentiary of the United States to Mongolia Michael S. Klecheski, talking over bilateral energy cooperation and stable operations of the energy system. 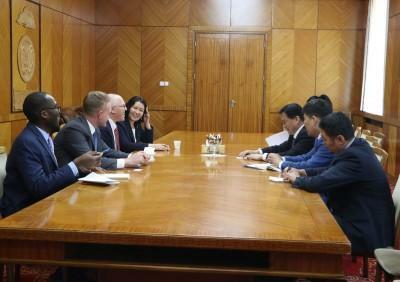 Present at the meeting were Head of Renewable Energy Department of the Ministry of Energy O.Bavuudorj and Economic/Commercial Section Chief at the U.S. Embassy in Mongolia Benjamin Le Roy. Expressing hope for further expansion of bilateral cooperation, Minister Ts.Davaasuren said, ”We take additional energy from Russia to meet loads during peak hours (6 PM – 9 PM). Now we are studying domestic sources for this from hydroelectric power plant, battery accumulator and diesel or gas turbine generators” The sides exchanged views on opportunities for cooperation in methane gas field, introducing energy-efficient, durable power generation system in Mongolia, establishing tripartite cooperation between Mongolia, the USA and Japan, and making a list for projects possible for the USA to implement in Mongolia’s energy sector. In the conclusion of the meeting, Ambassador Michael S. Klecheski briefed the regular consultative meeting between Mongolia and the US to be held soon, expressing that broader range of issues could be exchanged during the meeting and widen the cooperation.